Can Chin Kwai Fatt affect the KLCI's performance? We wrote to you on the same matter more than a month ago. And our letter ended with the following para. Bursa Malaysia, in your own words, you are a front line regulator, committed to maintaining high standards of Corporate Governance, in order to maintain market integrity. Please help save the dignity of CG in this country, as we have further irrefutable proof of fraud by PwC Malaysia, and the longer it takes, the harder it is to hold back. In our previous letter to your good selves, we spoke at length about the miraculous registration of PricewaterhouseCoopers by the AOB, and the fact that PwC is the auditor for more than a hundred public listed companies. Let us leave the issue of the registration aside, despite it being a physical and legal impossibility. 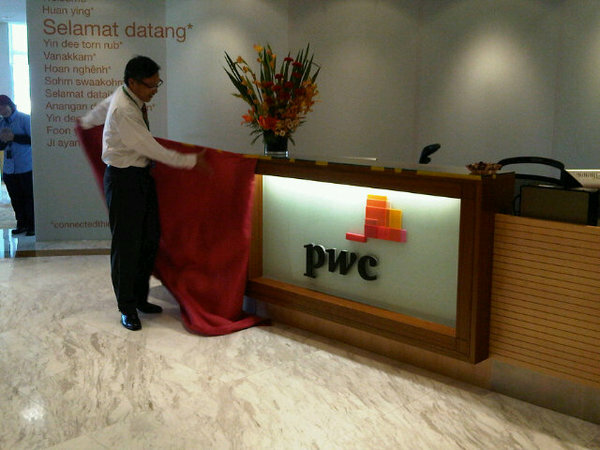 Let us ignore the fact that Chin Kwai Fatt & Co had 'sham directors' appointed to PwC Consulting Sdn Bhd (289801-A). Let us ignore the fact that Chin Kwai Fatt & Co used fraudulent methods to keep PricewaterhouseCoopers Consulting Sdn Bhd (464379-U) from becoming a part of the worldwide sale of PwC's Consulting arm to IBM Corp in 2002. Let us ignore every other act that Chin Kwai Fatt has managed to pull of since the fateful day he became the country managing partner for PwC in Malaysia. Can Bursa Malaysia ignore the fact that Chin Kwai Fatt signed a false declaration with regards to the returns for the company known as PricewaterhouseCoopers Consulting Sdn Bhd (464379-U) in 2008? Can Bursa ignore the fact that Chin Kwai Fatt has fallen foul of the law under the Malaysian Penal code , with this one single act? Can Bursa Malaysia keep silent when it knows that Chin Kwai Fatt runs the audit firm that does the audits for 9 of the top 20 companies listed in the Bursa? Can Bursa Malaysia keep silent, when so many billions of capital has relied on the findings of a man who has shown himself to be manifestly capable of doing whatever he feels as necessary to further his own needs, and not those of his profession?